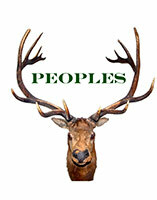 PEOPLES, like THE MOSS FAMILY SINGERS and WINSTON TASTES GOOD, takes place in the same small North Carolina town. Peoples Bank, a family-owned bank, has served that small town for over one hundred years, but recently has fallen on hard times due to the economic crisis that has crippled much of small-town America. Horace Abernathy, the president of the bank for many years, still like to do banking the old-fashioned way, but is no longer able to due to new restrictions from the federal government. Horace is found dead after a deer hunting accident, and now it is up to his family to carry on his legacy against insurmountable odds. His widow Maxine, who now runs the bank, is determined to keep tight control on everything and everyone as pressure closes in around her to change the way the bank does business. Horace’s son, Franklin is worried that a loan he desperately needs to start building a golfing resort may not happen now that his father is dead, and his wife Nancy who still thinks she’s an Atlanta debutante and daughter Harper, who has a drug problem, are still spending money like it’s going out of style. Into the mix are two woman with pasts to the Abernathy family. Lois McClure was a teller at the bank and Horace’s long-time mistress while Gwendolyn Lloyd, who now lives in Paris, has come back to settle her recently deceased grandmother’s will. Both women have secrets that could ruin the Abernathy family if exposed. Horace Abernathy - Male, early 70s, the president of Peoples Bank. Maxine Abernathy - Female, late 60s, Horace’s wife and the vice-president of Peoples Bank. Franklin Abernathy -Male, 45, Horace and Maxine’s son who is a real estate agent. Nancy Abernathy - Female, late 40s, Franklin’s wife. A former Atlanta debutante. Harper Abernathy - Female, 20, Franklin and Nancy’s daughter who is in college studying piano. Lois Mcclure - Female, 45, a teller at Peoples Band and Horace’s mistress. Paul Garrett - Male, early 20s, Lois’ nephew who is in seminary. Bradley Cunningham - Male, 20, Harper’s boyfriend from college who is studying violin. Gwendolyn Lloyd - Female, 45, black, Franklin and Lois’ high school classmate. She is a lawyer living in Paris, France. John Gibby - Male, 45, The Abernathy’s lawyer. J.D. Henson - Male, early 70s, a customer at Peoples Bank. Pete Smith - Male, early 50s, the town sheriff.